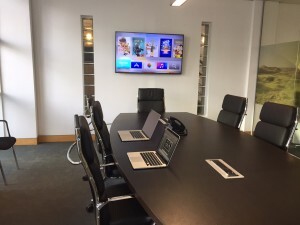 We have brought our extensive technical knowledge and expertise gained from years serving professional audio and video clients to the world of audio-visual installations for office, hospitality and education. Our work with screens, projectors, acoustics, speaker placement and calibration, network infrastructure, storage requirements and bandwidth, together with our cabling and installation abilities give us the edge in providing class-leading audio-visual solutions for boardrooms, hotels, entertainment systems, presentation systems, communications & teleconferencing, and public address. Using reliable, high-performing products directly evolved from the professional world, and incorporating the most popular content sources – including Sky, UPC, iTunes, Spotify, Netflix, Amazon, Skype, internet radio, as well as iPods, CD/DVD/BluRay players, games consoles and media servers – our systems can integrate all of your entertainment and communications systems into a single, easy-to-use interface. We have something for everyone – from simple and affordable “plug & play” off-the-shelf solutions, to comprehensive control systems managing everything: security, climate, lighting, audio/video systems, digital signage, communications, monitoring, automation… all controlled from your iOS or Android phone or tablet. We can “drop in” systems to an existing site, or liaise with architects and contractors to integrate your system right from the building stage. We take great care in choosing which products we offer – always favouring solid, high-quality products backed by proper warranties and long-term support – regardless of brand name, hype, “bells & whistles”, or price. Rather than wasting money on “disposable” products, we believe that any installed system should be able to run, and be serviced if necessary, for many many years.